Tata, who turns 75 tomorrow will be retiring from the USD 100 billion global conglomerate.Ratan Naval Tata ,born 28 December 1937 is an Indian businessman of the Tata Group .He was the chairman of the group frm 1991 to 2012. He is an Indian industrialists as well as a philanthropists.Tata received the Padma Bhushan, one of India’s most distinguished civilian awards, in 2000 and Padma Vibhushan in 2008 and Lifetime Achievement Award awarded by prestigious Rockefeller Foundation in 2012. Tata began his career in the Tata group in 1962; he initially worked on the shop floor of Tata Steel, shovelling limestone and handling the blast furnace.In 1991, JRD Tata stepped down as Tata Industries chairman, naming Ratan as his successor.In 1991 he was appointed as the chairman of the Tata group. Under his stewardship, Tata Tea acquired Tetley, Tata motors acquired Jaguar Land Rover and Tata Steel acquired Corus, which have turned Tata from a largely India-centric company into a global business, with 65% revenues coming from abroad. He also pushed the development of Indica and the Nano. 2010 Honorary Doctor of Laws Pepperdine University. 2010 Legend in Leadership Award Yale University. 2005 Honorary Doctor of Science University of Warwick. 2004 Honorary Degree of Doctor of Technology Asian Institute of Technology. 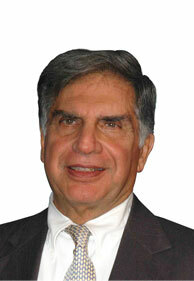 Ratan N Tata has been the Chairman of Tata Sons, the promoter holding company of the Tata group, since 1991. He is also the Chairman of the major Tata companies, including Tata Motors, Tata Steel, Tata Consultancy Services, Tata Power, Tata Global Beverages, Tata Chemicals, Indian Hotels and Tata Teleservices. During his tenure, the group’s revenues have grown manifold, totalling over $100.09 billion in 2011-12. Mr Tata also serves on the board of directors of Alcoa. He is also on the international advisory boards of Mitsubishi Corporation, the American International Group, JP Morgan Chase, Rolls Royce, Temasek Holdings and the Monetary Authority of Singapore. Mr Tata is also associated with various organisations in India and overseas. He is the Chairman of two of the largest private-sector-promoted philanthropic trusts in India. He is a member of the Indian Prime Minister’s Council on Trade and Industry. He is the President of the Court of the Indian Institute of Science and Chairman of the Council of Management of the Tata Institute of Fundamental Research. He also serves on the board of trustees of Cornell University and the University of Southern California.